Baby Play Gym Cute Owlet – a Perfect Grow-With-Me Toy for Your Baby’s Development! Could you ever imagine a money-saving toy that grows with your infants and helps them develop their skills and senses? Well, here it is! We’re glad to introduce to you our exclusive product – a kick and play gym for babies 0 to 3 years old. 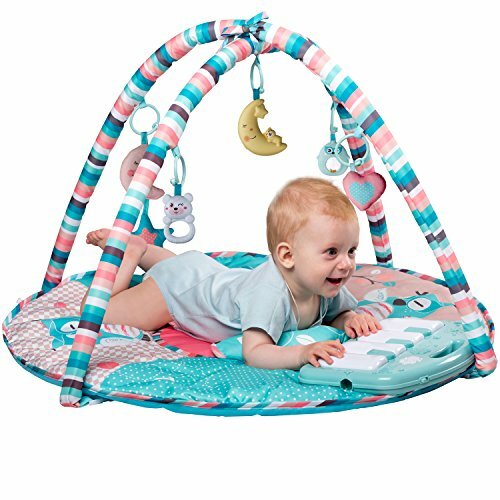 This baby kick and play mat comes with 5 activity toys and a piano keyboard to keep your children entertained and encourage them to develop fine motor skills, self-awareness, hearing, baby’s sight and sensory. Our thick baby play mat is soft and easy to clean. Remove the overhead arches and the keyboard to wash the baby gym in a washing machine. You can also carry the piano with you and let your baby play it on the go because it’s portable and battery operated (3 “AA” batteries required but not included). Your child will absolutely love a crescent moon shaped toy with lights. This Flashing Moon activity toy requires 3 LR44 button-cell batteries which are included and already inserted. Remove battery pull tab before first use to activate the toy. Enjoy the time spent with your baby listening to tiny melodies and the most beautiful sound on Earth – the sound of your child’s laughter. 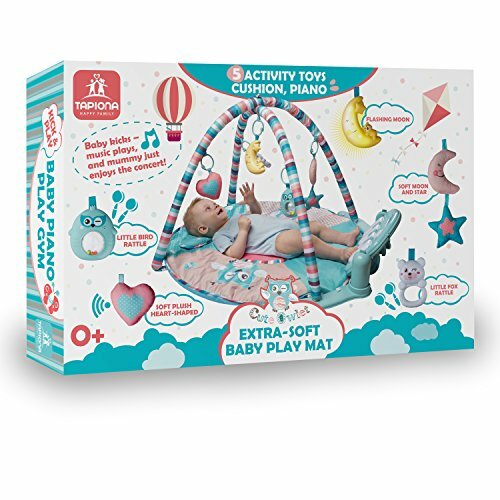 A TOY THAT GROWS WITH YOUR CHILD: our repositionable large baby play mat has 4 different modes of play: Lay and Play, Tummy Time Play, Sit and Play, and Kick and Play. This baby mat is suitable for age 0 up to 36 months and designed to grow with your child. If you’re looking for perfect newborn toys, this amazing grow-with-me play mat is the right choice. Save money and space by buying kick and play piano gym which can help you enhance your infant’s development and make it fun! 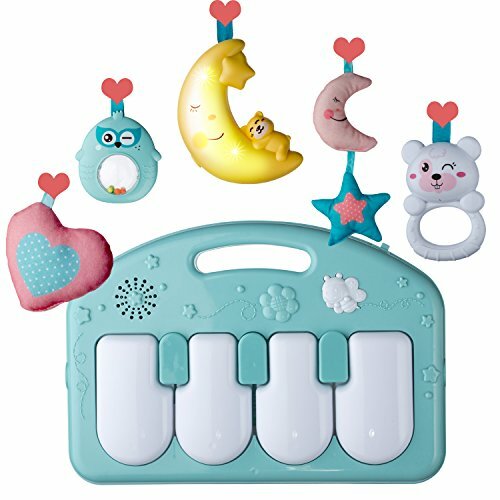 DEVELOPING BABY’S SENSES THROUGH PLAY: a play mat for babies by Tapiona is equipped with piano keyboard that rewards your child with nice melodies any time he or she kicks its keys. Bright lights and music stimulate all the senses, including hearing and sight. They can even develop child’s brain, and the small mirror at the top of the arch helps babies between the ages of 15 to 24 months to develop self-awareness. PLAY MAT FOR INFANTS – your ultimate helper in improving baby’s fine motor skills! Trying to kick a piano key is an excellent stretching exercise for your little one. While stretching and kicking, babies build their fine motor skills. 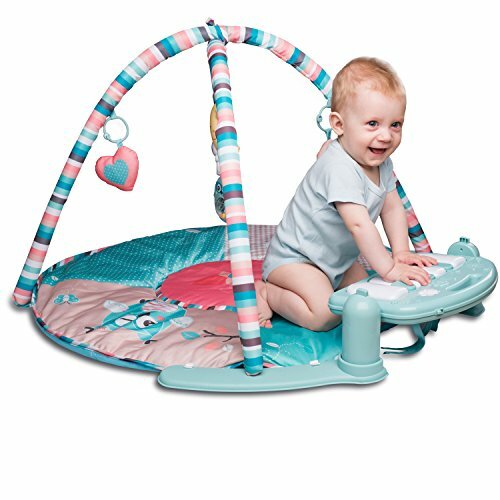 Our play mat helps develop baby’s coordination, encourages your infants to move their fingers, toes, hands and feet. 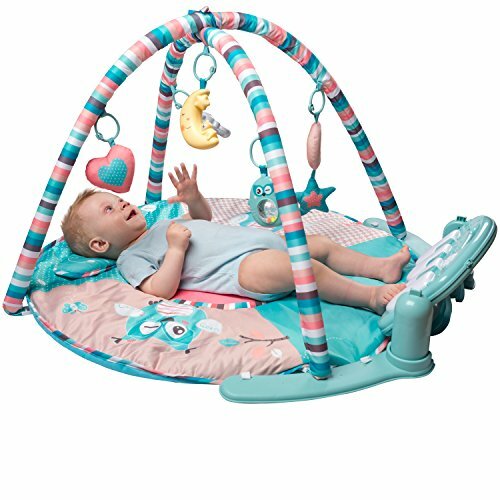 That’s how our play gym helps little children to build gross and fine motor skills, to strengthen baby’s muscles. ACTIVITY TOYS THAT KEEP YOUR CHILD ENTERTAINED: this activity play mat comes with 5 bright toys. They include a baby bear, a soft-to-touch heart, a cute owlet, a little star, and a funny crescent moon. This piano gym encourages your child to beat and grasp and also to learn to manipulate his or her fingers. These 0 to 3 months baby toys are designed to make the baby amused and entertained – no crying, no tears, only smiles and laughter. ACTIVITIES TO ENHANCE YOUR BABY’S COGNITIVE DEVELOPMENT: there’re 4 playing modes and 3 stages of play that encourage your child’s learning and growth. 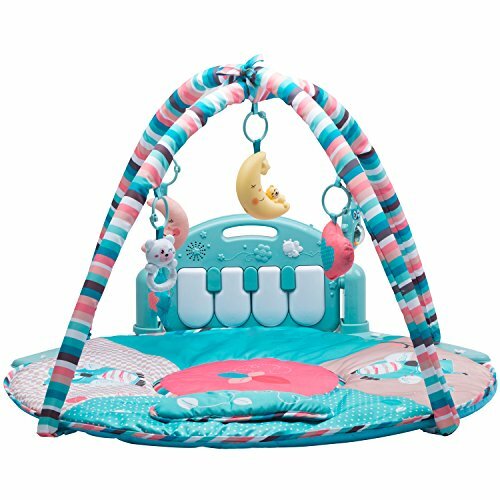 This infant activity mat with multi-play positions, attachable toys, and 10 different melodies will enhance your child’s cognitive development through playing.